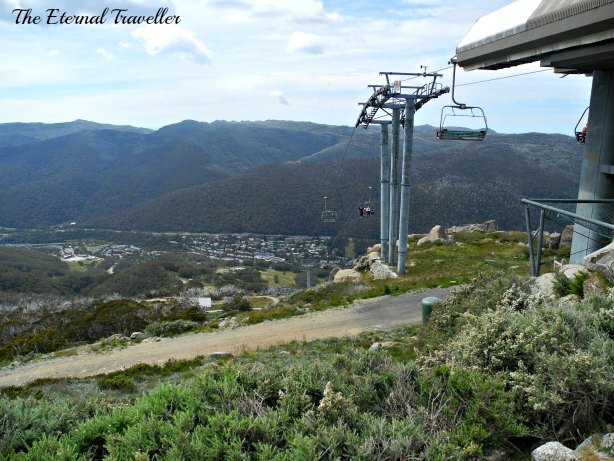 When I was young, my family went on a caravanning holiday to the Snowy Mountains. 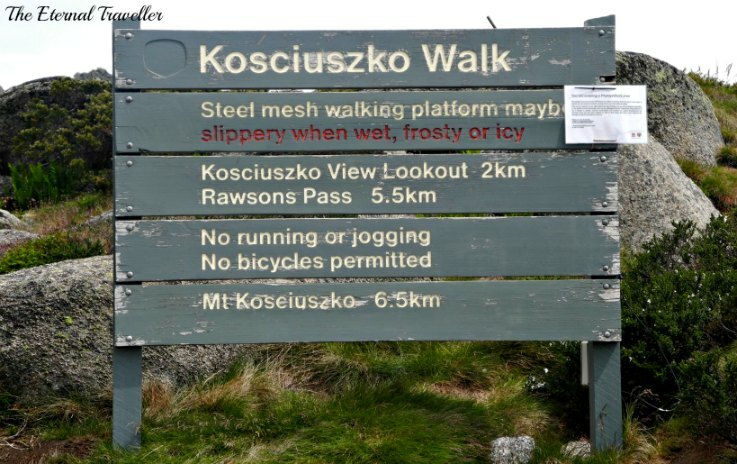 While we were there we climbed Australia’s highest mountain, Mt Kosciuszko. 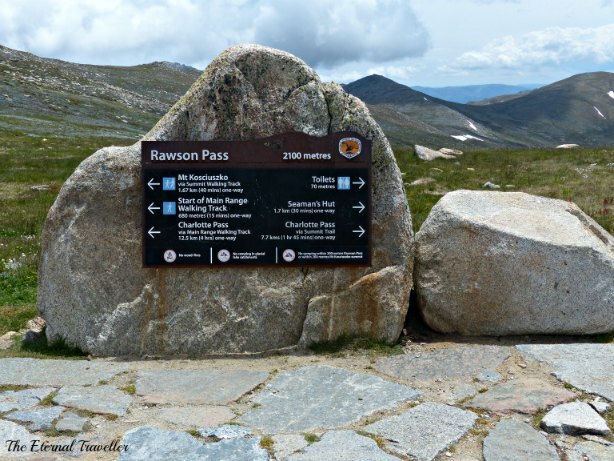 Dad was able to drive to within 700 metres of the peak, and we left the car at Rawson’s Pass to walk up the track to the top. That was more than 40 years ago and things have changed since then. 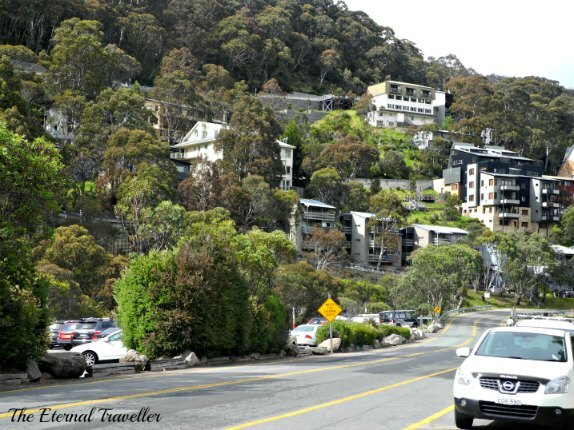 Now, the closest car park to Mt Kosciuszko is at the alpine village of Thredbo and the mountain is almost 7 kilometres away. 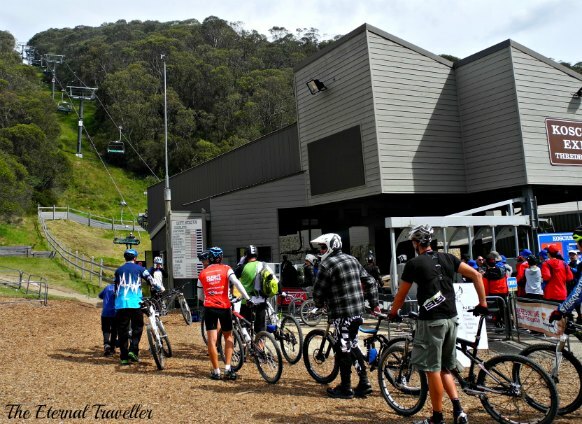 Thredbo is 1370 metres above sea level and it’s almost another 1000 metres higher at the summit. 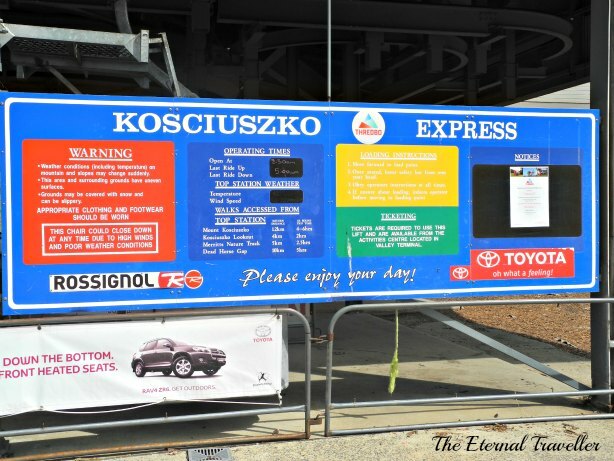 The journey to the top of Australia begins with the Kosciuszko Express Chairlift and it’s not just hikers who take advantage of the easy way up. 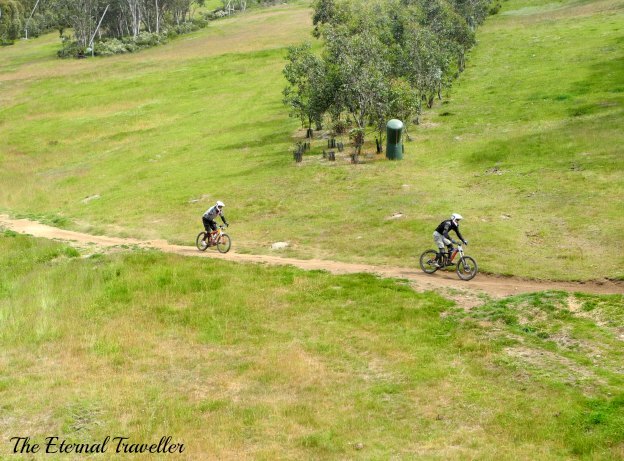 There are 35 kilometres of mountain bike trails in the area and thrill-seekers take their bikes up on the chairlift and ride the twisting mountain trails down to the valley floor at hair-raising speeds. 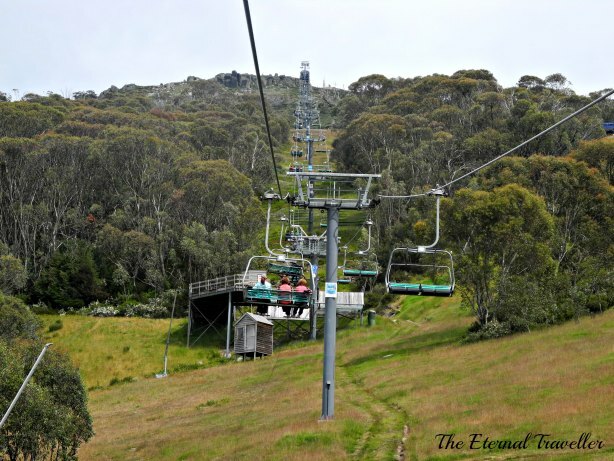 In contrast the chairlift takes 15 minutes to travel the 1.8 kilometres to the top of the ridge. 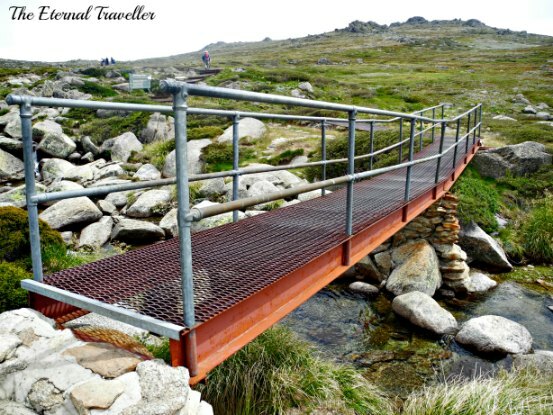 A footbridge across Merritts Creek marks the start of the walking track to the summit and from here it’s a 6.5 kilometre hike, most of which is reasonably level. 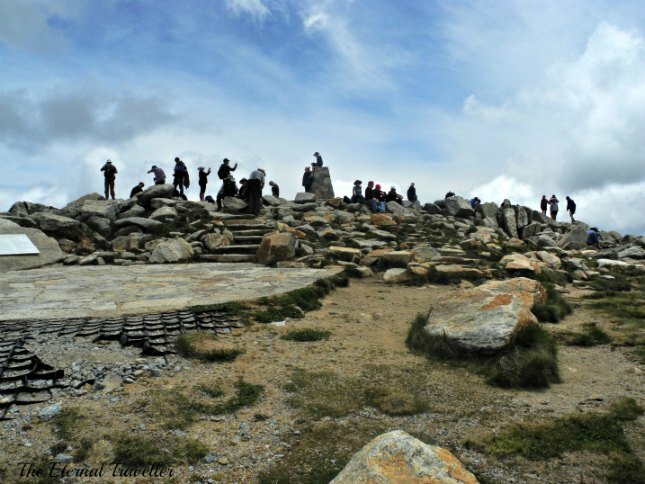 The metal pathway is raised off the ground and allows walkers to enjoy the heathland and alpine vegetation without causing any damage. 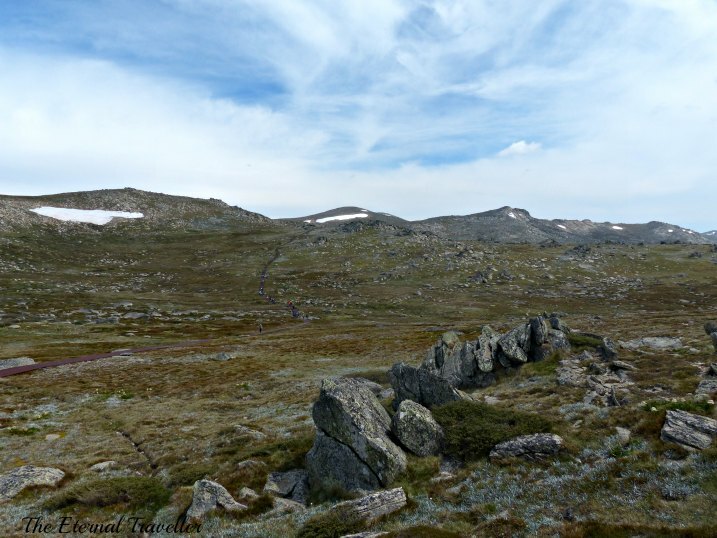 Mt Kosciuszko, still bearing patches of snow in mid-summer, first appears in the distance about a third of the way along the track. 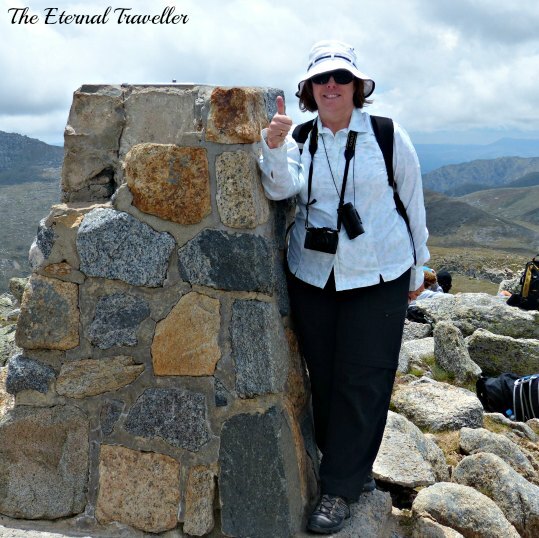 From the Kosciuszko Lookout the mountain looks no higher than the surrounding peaks and has none of the craggy appearance of other peaks in the world. 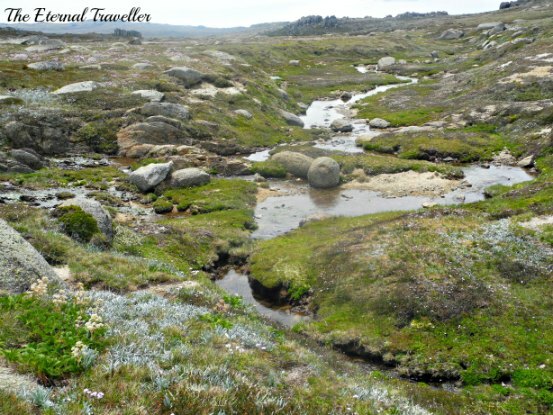 These ranges are some of the oldest on Earth and over millions of years they have worn away so that the highest point is only 2228 metres above sea level. 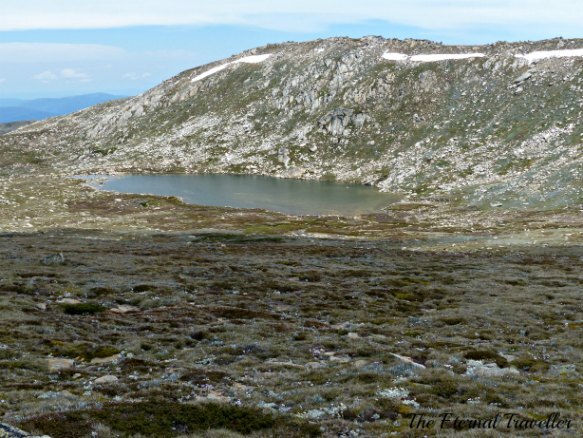 The walking track makes its way across the alpine slopes past the headwaters of the Snowy River and Lake Cootapatamba, Australia’s highest lake and one of its five glacial lakes, to Rawson’s Pass where it meets up with that old road I remember. From there, it’s a short but steep walk up the original track for the last 1.67 kilometres. It spirals around the mountain until, finally, the summit is up ahead. For the second time in my life I’m standing on the top of Australia. 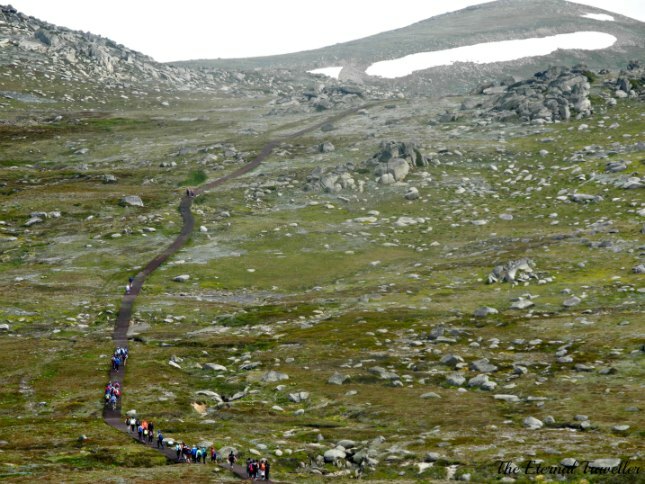 It’s a great feeling…now I just have to walk back to Thredbo again. It would be easy to be caught out by bad weather. We were very lucky to have a mild, sunny day, perfect for walking. What a great story. He’s probably forgotten but you’ll remember forever! It was quite mild the day we walked. It is fantastic isn’t it. A great hike. And no lack of people enjoying it. Yes, there was a constant stream of people walking that day, but too many at any one time. I really enjoyed this day. Well, it is a lot higher! Let’s just look at it and enjoy the scenery. What a great story. We live in the same county as the highest peak in the contiguous US. I had a chance to hike it with friends this April, but chickened out. You have to register months ahead of time, and then it’s a lottery to see if you get to hike it. I love your picture of all the people standing on the ridge. That ought to be your FB header or something. It’s such a great picture! You don’t even look out of breath! I’d be huffing by that point, I think. Oh right, the lift…. It wasn’t a very steep walk, just long. You should have done the hike in April. It would have made a great post. There were skinny high places on the hike. Not your gentle wide path. I have relatively poor balance, and I like low, wide paths! Oh no, skinny high places wouldn’t be good for me either. Best to just leave that walk I think. I agree, otherwise I’m afraid I might leave it permanently. I’ve been known to fall just standing on solid ground for no good reason. Of course, there isn’t a good reason for falling unless you’re in love.